EIFFEL TOWER walking distance, one of the more safety and favorites areas of Paris where Hemingway and his gang used to hang out. 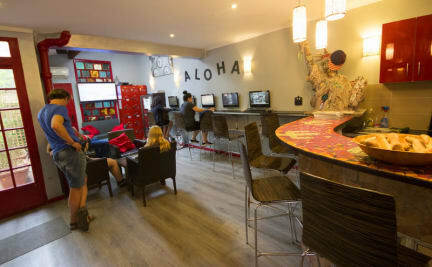 The hostel is a hop and a skip away from Paris' most famous sights including the Eiffel Tower, the Arc de Triomphe, the Champs Elysées, the Musée Rodin, the Musée des Armées and the lively Boulevard Montparnasse and Saint Germain des Prés. You will find one of the main metro lines only a short walk away which will permit easy acces to areas such as Montparnasse, Opéra and the Musée du Louvre. Paris is knocking at your door waiting to be discovered! We know that travelling on a budget is demanding. In fact, Aloha's founders were once backpackers themselves. A free breakfast is served each morning, and to prepare other meals we provide our guests with a fully equipped kitchen. A variety of supermarkets, laundromats, bakeries and a post office are all found nearby. An information stand with brochures on everything you need to know is available and our staff are always willing to help you out with anything else you may need. Free wi fi connection. You will not be just another number to us at Aloha. Our friendly English-speaking staff will make you feel relaxed and at home during your stay. Groups of 7 or more please contact the hostel before making your reservation - otherwise your booking will be automatically cancelled and your deposit lost. - To cancel or change (minimum 24 hours in advance) NOT over the telephone, you need to send an e-mail and wait for the answer from us, you should keep the confirmation of cancelling. For groups (more than 8 people) you should cancel 2 months in advance, otherwise your card will be credited for the firs night.